For the articles about the series and universe respectively, see Super Smash Bros. (series) and Super Smash Bros. (universe). Super Smash Bros 64., released in Japan as Nintendo All Star! Dairantō Smash Brothers (ニンテンドウオールスター! 大乱闘スマッシュブラザーズ, Nintendo All-Star! 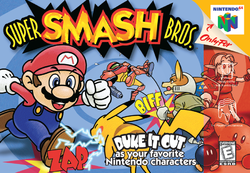 Great Fray Smash Brothers), often shortened to "SSB", retronymously "Smash 64" or "SSB64", is the first game of the Super Smash Bros. series. The game released in Japan on January 21st, 1999, in North America on April 26th, 1999, and in Europe on November 19th, 1999. The game is playable on Nintendo 64, and is available on the Wii's Virtual Console. It was later released on the iQue Player in China on November 15, 2005. The Virtual Console version released on January 20th, 2009 in Japan, a day before its 10-year anniversary, and later, 2009 in Europe and North America, respectively. However, due to the Wii Shop Channel ceasing operations on January 30th, 2019, the only way to obtain the game now is by purchasing a used copy or playing it on an emulator. Super Smash Bros. received positive reviews, with most praise going to its multiplayer mode, while its single-player mode received criticism. The game has sold 5 million units worldwide as of 2001, making it the fifth best-selling Nintendo 64 game of all time. The opening movie in Super Smash Bros., unlike later games in the Super Smash Bros. series, completely lacks pre-rendered footage, instead opting to render everything in real-time. When the opening movie starts, two random starter characters are chosen to be placed by Master Hand on top of a desk, which transitions to a scenery resembling Peach's Castle. This process is repeated every time the opening movie is played. At the end of the opening movie, the figures of the four unlockable characters are quickly shown against a white background. If a character hasn't been unlocked, it will simply be shown as a silhouette; reversely, they will be deobfuscated once unlocked. After this, the opening movie directly segues into the title screen, a trend which would be followed by future installments, along with the announcer calling out the game's title. Official artwork of the default cast of Smash 64. 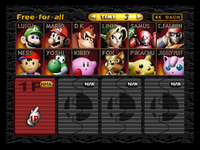 The character-selection screen of Super Smash Bros. (all characters unlocked). There are twelve playable characters in Super Smash Bros., eight of which are available from the start, and four of which are unlockable. The most amount of slots are given to the Mario and Pokémon universes with each getting two characters: Mario alongside his brother Luigi, and Pikachu and Jigglypuff, respectively, with the latter characters in both universes being unlockable. Two more slots are given to reoccurring Mario characters Donkey Kong and Yoshi as representatives of their sub-universes, Donkey Kong and Yoshi respectively. The remaining starter characters are Link, Samus, Kirby and Fox from The Legend of Zelda, Metroid, Kirby and Star Fox universes respectively. Along with Luigi and Jigglypuff, two more characters are unlockable, being Ness and Captain Falcon from the EarthBound and F-Zero universes respectively. The stages of Super Smash Bros. Shown in bold, Mushroom Kingdom is the only unlockable stage in Super Smash Bros. These stages only appear in the 1P Game. *The 1P Game-only Yoshi's Island lacks clouds and has closer blast zones. These stages cannot be unlocked or played on in any way without hacking. Unlike its successors, Super Smash Bros. never enjoyed a large professional competitive scene in North America. However, interest in the game has been renewed in recent years with the popularity of its sequels. Players can play Super Smash Bros. online through Kaillera using the Project64k emulator. Recently, there have been more and more tournaments of Super Smash Bros. due to an influx of new players. Most Super Smash Bros. tournaments are paired up with Melee events and most (offline) SSB tournaments are located in California, Canada, New Jersey or Peru. The required number of victories to win are generally the best of 3 matches; the only exceptions are finals, in which the number of matches is 5 or 7. Double eliminations are in place. 4 stock with a 8-minute time limit, if it is possible; the original game does not support placing a time limit on stock matches, but emulators and mods can implement one. The first match is played on Dream Land. For the first match, characters are chosen double-blind - at the same time, so that neither player knows their opponent's character beforehand. Players may re-pick characters after each match. However, the loser of each match gets to pick last (known as slob picks). Masahiro Sakurai was interested in making a fighting game for four players. His initial design for the game was called Kakuto-Geemu Ryuoh (Dragon King: The Fighting Game), which featured simple characters. After presenting the game to co-worker Satoru Iwata, he helped Sakurai continue on with the project. Sakurai understood that many fighting games did not sell well, so he tried to make his game original. His first idea was to include famous Nintendo characters and put them into the fray. Knowing he would not get permission to do so, Sakurai created a prototype of the game without sanction from Nintendo and did not inform them until he was sure the game was well-balanced. The prototype he presented featured Mario, Donkey Kong, Samus Aran, and Fox McCloud as playable characters. The idea was later approved. Super Smash Bros. features music from some of Nintendo's most popular gaming franchises. While many tracks are new arrangements for the game, some songs are taken directly from their sources. The music for Super Smash Bros. was composed by Hirokazu Ando, who later returned as sound and music director for Super Smash Bros. Melee. A complete soundtrack was released on CD in Japan through Teichiku Records in 2001. Super Smash Bros. was a commercial success, selling 5 million copies worldwide with 2.93 million sold in the United States and 1.97 million copies sold in Japan. It was the 5th best selling game for the Nintendo 64. Reviews were mostly positive, with many critics praising the game's addictive and fun multiplayer gameplay and simple controls, but it was criticized as well, mainly due to the game's lack of content and somewhat limited single player mode. Group artwork depicting Kirby, Mario, Fox and Link, including some items like Bob-omb, Star Rod and the Fan. Using the phrases "Game Set" and "Time Up" in matches in all regions. Later games use the phrases "Game!" and "Time!" in the English version, while each one still uses "Game Set" and "Time Up" in the Japanese version. Lacking stages from the F-Zero and EarthBound universes. Introducing new characters from the Yoshi and F-Zero universes. Not having Bowser as the heaviest character, as he did not make his first playable appearance until Melee. Rather, the heaviest character is Donkey Kong. Featuring only playable protagonists. However, two characters had previously appeared as antagonists -- Donkey Kong in Donkey Kong, its Game & Watch counterpart, Donkey Kong 3 and Donkey Kong (Game Boy), and Mario in Donkey Kong Jr. and Donkey Kong Circus. Being rated "E" for Everyone by the ESRB, as its successors Super Smash Bros. Melee and Super Smash Bros. Brawl would be rated "T" for Teen, and Super Smash Bros. 4 and Super Smash Bros. Ultimate would be rated "E10+" for players who are aged ten and over. As a result, it is also the only game not to share its ESRB rating with another game in the franchise. Showing the stage's 3D model when highlighted on the Stage Selection screen, as well as restricting the cursor to the squares depicting the stage. Not having Battlefield and Final Destination as normally playable stages. Not allowing characters to grab ledges from behind in any way. Not including Side special moves, as these would be added in later games. Having multiple crowd reactions for when a character recovers. The starting eight characters are placed in the order of when they first appeared in their respective debut titles on the character selection screen, starting with the oldest, Mario and Donkey Kong, and ending with the most recent, Pikachu. 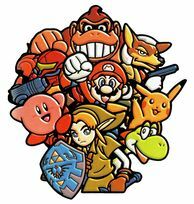 This same order is used when listing the cast of the original Super Smash Bros. in later games, such as when organizing trophies. This chronological ordering also applies to the four unlockable characters on the character selection screen, though this is only relative to each other and not the other characters. Super Smash Bros. marks the first appearance of Samus, Kirby, and Ness in 3D. Additionally, this game is the only Nintendo 64 title in which Samus or Ness appears. This game has the least amount of unlockable characters, at four, and also has the least amount of unlockable stages (out of games that have them), at one. This game is one of two that uses 2D illustrations on the box art, alongside Super Smash Bros. Ultimate. If the player achieves No Miss x11 at the end of Classic Mode, the announcer will say "Incredible!" instead of "Congratulations!" on the victory screen. Smash 64 is the only Smash game whose ESRB rating is unique. Namely, it is rated E, whereas Super Smash Bros. Melee and Super Smash Bros. Brawl are both rated T, and Super Smash Bros. 4 and Ultimate are both rated E10+. ↑ 1.0 1.1 1.2 1.3 1.4 Iwata Asks: Super Smash Bros. Brawl. Nintendo. Retrieved on 2008-01-31. ↑ 社長が訊く『大乱闘スマッシュブラザーズX』 (Japanese). Nintendo. Retrieved on 2008-01-31. ↑ Nintendo All-Star! Dairanto Smash Brothers Original Soundtrack. Soundtrack Central (2002-01-17). Retrieved on 2008-04-16. ↑ ニンテンドウ64 - ニンテンドウオールスター!大乱闘スマッシュブラザーズ. Weekly Famitsu. No.915 Pt.2. Pg.32. 30 June 2006. ↑ Gerstmann, Jeff (1999-02-18). Super Smash Bros. Review. GameSpot. Retrieved on 2008-04-26. ↑ Schneider, Peer (1999-04-27). Super Smash Bros. Review. IGN. Retrieved on 2008-04-26. ↑ 7.0 7.1 Super Smash Bros. Reviews. GameRankings. Retrieved on 2013-07-14. ↑ Super Smash Bros. (n64: 1999): Reviews. Metacritic. Retrieved on 2013-07-14. This page uses content from Wikipedia. The original article was at Super Smash Bros.. The list of authors can be seen in their page's history. As with SmashWiki, the text of Wikipedia is available under the Creative Commons Attribution-ShareAlike 3.0 Unported Licence. This page was last edited on April 24, 2019, at 07:31.